This month's image was taken on the 29th August 1977 - August Bank Holiday Monday (and it's not raining!). 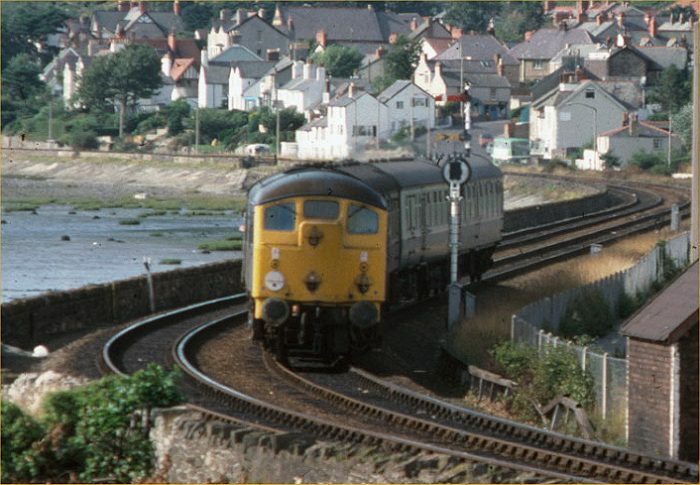 24081 approaches Llandudno Junction from the Llandudno branch with a return shoppers' special to Holyhead. The train is formed of a mark I TSO, a Mark II BFK and a Mark I CK. 25074 was waiting at the Junction station to take the train on to Holyhead. This train was run to cater for day trippers from Ireland, and Llandudno was regarded as the nearest reasonably sized shopping centre (well, it had Marks And Spencers and Asda!). Not advertised in the BR timetable, it seems to have picked up a few window-hangers. At Holyhead, it collected passengers from the 12:30 arrival from Dun Laoghaire, and returned them in time for the 18:30 sailing back to Ireland. The train is running alongisde to Conwy estuary, now reclaimed at this point for the building of the Conwy road tunnel.